All indications are that when ESEA is finally reauthorized states and local district leaders will get what they say they want: significantly more flexibility. But to these happy folks I say, be careful what you wish for! As a former state education official I longed for flexibility with federal mandates. But I would be less than honest if I didn’t admit that I would also use federal mandates to keep constituency groups at bay. “Federal regulations require it” was often a go-to phrase. Under draft ESEA proposals, states still must target resources to the lowest performing schools and implement strategies that will address educational deficiencies. Additionally, states and districts will still be required to address educational challenges for students with disabilities, English language learners, students of color and students living in poverty. But what they need to do to meet those requirements may look markedly different. We do know that staff for both Houses of Congress are furiously trying to craft a final bill that balances competing priorities so that states and local school districts can move forward to better serve our students. If we look at the Alexander/Murray bill as a guidepost, we can anticipate fewer federal directives in the areas of: standards; Title 1 plans; metrics and targets for school turnaround; required instructional models and strategies for school turnaround; requirements for English language learners; and teacher evaluation as it relates to measuring student growth. In the new ESEA era, we will not be able to blame federal requirements for our inability to strengthen education for all students. 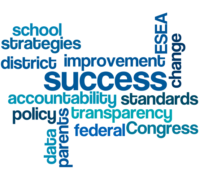 While many changes are likely in the ESEA legislation, what almost certainly won’t change is the requirement for the transparency of student performance. Putting my SEA hat back on, here are the key things I think SEAs must be attentive to in the coming era of fewer federal directives. 1. Commit to school improvement, not school improvement models. School turnaround is a complex process with more examples of failure than success. But we shouldn’t let frustration with school turnaround models get in the way of recognizing the importance of having thoughtful policies to guide school district efforts and targeted resources to get the job done. With flexibility comes the opportunity to be innovative and creative. Educational communities gain the opportunity to work on the root causes of underperformance and apply strategies and resources to solve identified problems. A note of caution: Beware of the “sales pitch” from reformers who believe that they have the model that will address all your needs. Beyond the numbers they run by you, drill down to understand how the turnaround model engages the educational community, including parents. Find out the model’s impact on teachers and students, the resources needed to sustain it, the results with students who are most at risk educationally. Signing the check is not your only responsibility. 2. Standards are for students not politicians. Standards need to be clear statements about what students need to know and be able to do, not talking points for politicians. The old adage “If you don’t know where you are going, any road will take you there,” should not apply. Colleges, business and industry have a real stake in getting standards right, since standards are the foundation for creating curriculum that prepare students to be college and career ready. We need standards that provide a meaningful roadmap for teachers, guiding their classroom instruction and their development of grade-appropriate assessments to measure mastery. 3. There is no rock to hide behind in the digital age. It won’t be very difficult to compare state data in the areas of expected student growth, graduation rates, college remediation rates and NAEP scores. Since states will still be required to report key performance metrics by subcategory of students (e.g. students with disabilities, English language learners, students living in poverty, etc. ), performance gaps will still be in the spotlight. Dumbing down accountability will not work. 4. If it’s not working, stop doing it. In more than one instance as a state official, I found myself questioning whether I really wanted to know if a specific approach to a problem is producing its intended outcome. If a selected approach implemented to address an educational problem is not working what are the implications relating to policy, financial resources and/or the credibility of the state education department? It was a lot easier to just move on to the next problem and not worry about the past. States now have the opportunity to implement innovative approaches, measure results and probe why certain strategies were effective or not without exposing a school district or school to draconian consequences if not successful. You are not tied to a specific model or approach. Just focus on outcomes. Creating an ongoing monitoring and evaluation system allows states to make adjustments as needed. Local context may make certain approaches less effective in one LEA versus another. It’s not the easiest thing in the world to acknowledge that an educational initiative has not worked, but you will now have evidence why different strategies are needed and you have the flexibility to move in a new direction. 5. Teacher evaluation is not the enemy. If teaching is the most important variable for student learning, why isn’t it appropriate to evaluate teachers’ work based on student learning? How does a value-added score or a student growth percentile help a teacher to strengthen practice to positively impact student learning? With a new ESEA we may be able to set aside algorithms and think how we can most effectively measure the performance of the teacher and the impact of the teacher’s classroom instruction on student growth and achievement. Here SEAs have a real opportunity to create effective approaches that are designed to support teachers’ development and hold them accountable for ensuring that all their students are succeeding. So what do we do know? Creating effective education policy in light of increased flexibility will be a messy affair. It calls for engaging all stakeholders and addressing a wide spectrum of opinions—and doing so in a transparent environment. Really listening to what stakeholders want is a critical first step. Listening means more than just nodding your head in agreement. It means addressing all relevant feedback by indicating what has or has not changed in the proposed policy as a result, and why. Navigating the fault line between “giving in to pressure” and “crafting a reasonable approach” that multiple stakeholders can support will be a key challenge for state officials. But the bottom line is that an SEA can’t effectuate change by itself. To really improve education for the students we serve, all players in the educational arena need to be involved and contributing to workable solutions. ESEA flexibility opens the door for building locally-developed and supported approaches to school improvement. But it will be hard work.